Europe was arguably the most backward and least advanced of the world's majorly populated regions in the time period of the Middle Ages. Due to the collapse of the Roman Empire and barbarian's general lack of respect for innovation, Europe fell far behind the other regions of the world. Not until Charlemagne converted a large portion of the continent to Christianity did Europe begin to innovate again. This was the most commonly made form of the plow. It was made of sturdy wood and had a head tipped with metal, typically iron. As has been made apparent, Europe was in quite literally a dark age at the beginning of this time period. All higher level thinking had virtually vanished from the realm. The majority of the great philosophy of ancient Greece was taken and nurtured by the Muslims in the Middle East. When trade and specifically the crusades took place between Europe and the Middle East, Europe began to regain its "lost knowledge". Travelers brought back philosophical concepts from the likes of Aristotle and Socrates as well as mathematical innovations by the Arabs themselves. The idea of algebra as well as the concept of zero were introduced to the European world with immediately positive effects. Cutlural centers (cities) began to emerge in what had been rural farm country for hundreds of years. This learning in addition to the food surplus caused by European agricultural innovation led toa middle class and all new job specialization within Europe. The House of Wisdom in Baghdad was home to countless numbers of books ranging form masterpieces of the ancient Greeks to new ideas by the Muslims themselves. It was where most of what we know about Greek and Roman philosophical thoughts comes from due to the thoughtfulness of the Muslims to rescue these copies and preserve them. Iron also played a pivotal role in Europe's exit from poverty and the dark ages. Through the refinement of iron, Europe was able to make better tools and weapons and so thus could grow at a much quicker rate. Iron had been known to Europe for a long time, however by implementing new techniques learned from the Middle East they were able to refine the iron and make it much stronger. This allowed for better agricultural tools that in turn boosted the population and the role of specialization within Europe. Furthermore, with superior weapons rulers were able to establish kingdoms that provided moderate stability within the region. 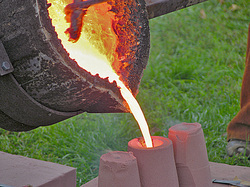 This picture illustrates the process of pouring liquid iron into a cast to form tools. The tools shown in the picture were fairly standard of most medieval blacksmiths.